Leeds United ended a two-month winless streak at Elland Road today courtesy of a first half header from Liam Cooper. Brentford came to Elland Road already incensed by Leeds United’s ludicrously high ticket pricing. A seat off to the side of Elland Road’s West Stand – an area of the ground so long starved of attention, we’d require a bulldozer to fix it at this stage – was priced at £39, increasing to £44 if bought on the day. That’s an awful lot of money to watch two mid-table sides scrap it out in England’s second tier. 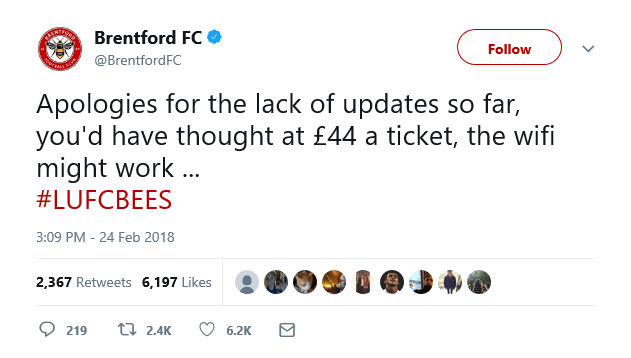 It was a point Brentford’s social media team were quick to highlight, complaining that such premium pricing should come with better wifi coverage. That wasn’t the only thing The Bees were unhappy with. After losing the game, their manager was sour grapes personified in his post-match interview, first complaining about a referee who kept them in the match by being too trigger-happy with his whistle, failing to play a major advantage that would surely have put the game to bed. I doubt if any Brentford fan could make a reasonable argument that the ref did anything but aid their cause today. Following that, Dean Smith complained that the grass was TOO LONG. 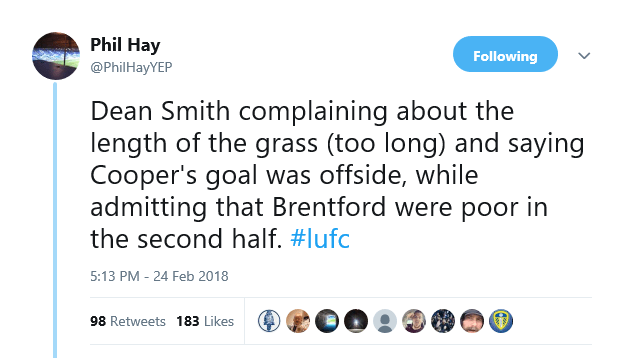 Of all the excuses I’ve heard from managers over the years, the grass being too long takes the prize for the most ridiculous. The fact Elland Road still enjoys full coverage of grass at this stage of the season is testament to the great work our groundstaff do. It’s not many years (and it’s still the case at a lot of grounds) since a February fixture was 50% mud wrestling. 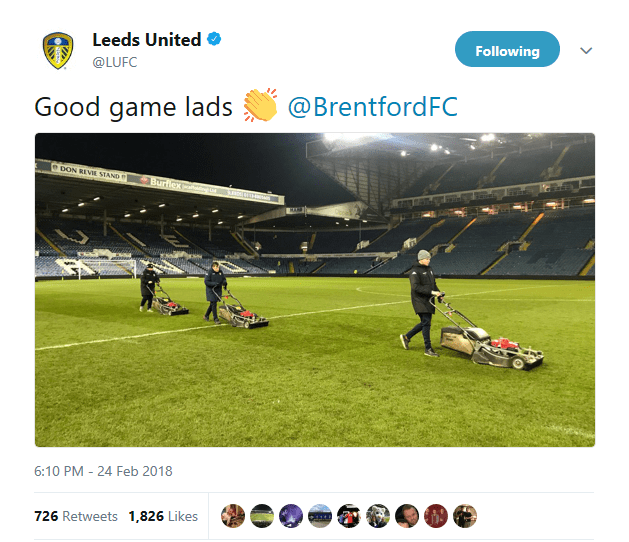 Seizing on the chance to restore some social media pride following the hammering the club’s horrendous new badge attempt deservedly incurred, the official Leeds United twitter account sprung into action, quickly pulling out the lawnmowers to stage a great photo comeback and award Leeds United their second victory of the day.